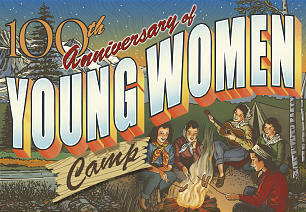 During the summer of 1912, 82 young ladies from the Liberty Stake in Salt Lake City participated in a week-long rough-out camp. They slept in a cabin and learned about flowers, insects, birds and plants. With the help of 15 leaders, they cooked and ate outdoors. They built a swimming hole and waded in the cool water. At the end of the week, they entertained their parents and ward members who visited the camp. One century later, Latter-day Saint young women worldwide carry on the traditions they started. In fact, the Church's first recorded Young Women camp, held 100 years ago on the banks of Big Cottonwood Creek in Murray, Utah, wasn't so different than camps today.